Optimal BP Management is the first broad-spectrum nutritional supplement to combine potent, standardized concentrations of novel nutritional agents in one convenient, easy-to-use formula for maintaining healthy systolic and diastolic blood pressure already within normal range. Helps maintain healthy systolic and diastolic blood pressure. Provides CVH 15, a whey protein isolate for healthy blood flow. It inhibits angiotensin converting enzyme. Since this enzyme can act to increase dangerous activity of the blood vessel constrictor angiotensin, the peptide's inhibiting effect on this enzyme can help to maintain already normal blood flow and blood pressure. Provides grape seed extract for healthy blood vessel dilation, thereby promoting healthy blood flow and blood pressure already within the normal range. Provides pomegranate extract for countering blood vessel constriction. Pomegranate extract is an abundant source of antioxidant polyphenols, particularly a tannin called punicalagin that functions as a powerful antioxidant and also inhibits angiotensin-converting enzyme, thus supporting blood vessel dilation and countering vessel constriction. This extract not only supports blood pressure management, but also may provide added cardiovascular protection by promoting healthy endothelial function and inhibiting low-density lipoprotein (LDL) oxidation. MegaNatural®-BP is a patented grape seed extract standardized to high content of polyphenolic compounds. 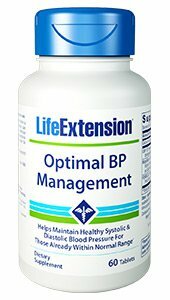 Optimal BP Management is the first broad spectrum nutritional supplement to combine potent, standardized concentrations of novel nutritional agents in one convenient, easy to use formula for maintaining healthy systolic and diastolic blood pressure already within normal range. DIRECTIONS: Take two (2) tablets in the morning preferably before a meal, or as recommended by a healthcare practitioner. If needed, take two (2) additional tablets in the evening. Other Ingredients: microcrystalline cellulose, stearic acid, silica, maltodextrin, croscarmellose sodium, vegetable stearate, aqueous film coating (purified water, hydroxypropyl methylcellulose, glycerin).